For more than a decade, scientists and volunteers around the Gulf of Maine have been plucking mussels from the shoreline and examining them to determine environmental conditions. Under the auspices of a Gulf of Maine Council program called Gulfwatch, the mussel tissues are analyzed for a list of potentially toxic contaminants, including chlorinated pesticides, polychlorinated biphenyls (PCBs) and polycyclic aromatic hydrocarbons (PAHs). In elevated concentrations, these types of contaminants can cause cancer, mutations, neurological disorders and disrupt endocrine systems. can help scientists, government agencies, businesses and environmentalists in developing regional plans and programs. Along with providing baseline data, the information also helps determine if and how water quality in a particular area has been affected by a specific occurrence such as an oil spill. In a recent interview, Jones said that the diversity of the Gulf’s coastline–spanning from urban to rural–makes it impossible to draw a generalize picture of the levels of contaminants in the region. However, he added, since the program began, scientists have seen an overall decrease in some contaminants from the 60 sites sampled. In the following excerpt, Jones talked about the evolution of Gulfwatch, some of its findings and concerns. Gulfwatch is a Gulf of Maine Council supported monitoring program. The program addresses both public health and ecosystem quality issues related to toxic contaminants. It entails monitoring for trace metals and toxic organic compounds using blue mussels as an indicator of the level and extent of contamination in the Gulf of Maine. The monitoring is conducted in all five jurisdictions of the Gulf and all participants are volunteers. The results have been published in eight consecutive annual reports, two scientific, peer-reviewed articles and translated into fact sheets and summaries for environmental managers and the public. The data and most reports are on the Council’s Web site [www.gulfofmaine.org/library/ gulfwatch/index.html]. Gulfwatch was launched more than ten years ago. What were your concerns at that time? When beginning to develop the early projects for the Gulf of Maine Council it was recognized that toxic contamination is transboundary and unlike other issues very little was known about toxic chemicals on a Gulf-wide basis. Monitoring for toxic chemicals is an important component of many monitoring efforts and Gulfwatch was modeled after the ongoing NOAA [National Oceanic and Atmospheric Administration] Mussel Watch program. What is Gulfwatch focused on today? Gulfwatch is looking at a suite of priority contaminants which are either persistent in the environment or can cause unwanted effects if present at high enough concentrations. These contaminants can be harmful to humans through the consumption of seafood or toxic to other organisms through exposure in the marine environment. Gulfwatch provides information that shows whether these contaminants are present at levels above what are natural conditions, as a result of human activities. Could you give an example of specific contaminants of concern at this time? Mercury still has numerous active sources in the Gulf of Maine, the most significant of which is atmospheric deposition. As a result of this source, mercury is found at elevated levels at many sites around the Gulf of Maine. 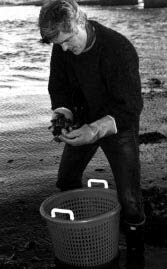 Having mercury concentration information for blue mussels allows scientists to incorporate this data from the marine environment with that from freshwater environments –lake water, loons and fish–into their models to provide a more comprehensive assessment of mercury impacts and dynamics in the whole Gulf of Maine ecosystem. Other contaminants of immediate concern are those that are listed in the warnings for human consumption of seafood, including PCBs and dioxin. Have any of the contaminants monitored for decreased in concentration? Since 1991, we have been analyzing mussel tissue for ten different heavy metals and four types of toxic organic contaminants at over 60 sites. 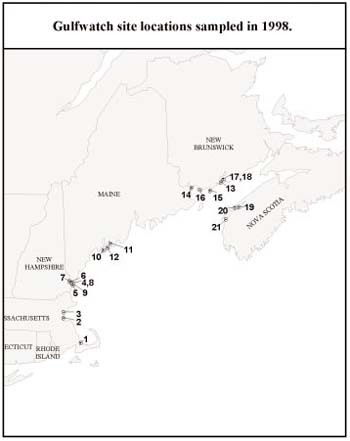 The sites vary from Boston Harbor to sites in Maine far from any human activities. Thus, it is difficult to make general statements about decreasing contaminant concentrations across the whole Gulf of Maine. We have seen both increases and decreases of all the contaminants at different sites within the ecosystem. When looking at all the contaminants and all the sites over time the results show that there have been more decreases than increases. What have been the five major successes for the first ten years of Gulfwatch? The first is simply the fact that we overcame the logistical challenges in establishing a multi-jurisdictional, national and international effort. Second, we have successfully maintained participation and financial support for 11 years. Third is the ability to provide useful information to public health officials and environmental managers throughout the Gulf of Maine. Fourth is that we have been able to establish a Gulf-wide baseline of contaminant concentrations as well as to draw attention to sites where contaminants are present at higher concentrations. And finally, that we have drawn local, jurisdictional, national and international recognition as an important regional monitoring effort. Theresa Torrent-Ellis is the outreach and education coordinator for the Maine Coastal Program/Maine State Planning Office. In New Brunswick the Letang Estuary and two sites in the inner harbor of Saint John had elevated levels of silver, chromium, nickel, copper, polynuclear aromatic hydrocarbons and organochlorine pesticides, the majority of which were higher than the Gulfwide median. Widespread elevated levels for chromium, copper, lead and especially mercury suggest possible regional sources of these contaminants. OMercury was highlighted in the fiveyear review as unusually high and a possible concern. The concentration of organic contaminants, especially polychlorinated biphenyls and organochlorine pesticides, tended to be higher in the southwestern Gulf. The majority of metal concentrations appeared to decrease, while most organic contaminant concentrations were higher than in 1995. Heavy metals are persistent environmental contaminants–meaning they cannot be degraded or destroyed. They tend to accumulate in soils, seawater, freshwater and sediments. Excessive levels of metals in the marine environment can affect marine life and pose risk to human consumers of seafood. Sources include various industrial activities such as present and former mining activities, foundries and smelters and diffuse sources such as piping, combustion byproducts and automobile emissions. Several heavy metals, like cadmium, lead and mercury are highly toxic at relatively low concentrations and can accumulate in body tissues over long periods of time. Polycyclic Aromatic Hydrocarbons PAHs) are present in low concentrations virtually everywhere. Elevated concentrations of PAHs can occur from prolonged industrial burning or by release of materials such as creosote-based wood preservatives, which contain PAHs in high concentrations. Sources include power plants, domestic heating systems that burn oil, coal or wood, gasoline and diesel engines, waste incineration, various industrial activities and tobacco smoke. Chlorinated Pesticides (TPESTs) are man-made organic chemicals that have been used to control everything from fungus to grasshoppers. DDT was the first that was used on a large scale in North America; it was heavily applied in agricultural regions. Most organochlorine pesticides have been banned in Canada and the United States, but are still routinely found in air and precipitation. Polychlorinated Biphenyls (PCBs) are a group of over 200 man-made chemicals. They are extremely persistent compounds. Because of their insulating and fire-resistant properties, mixtures of PCBs were commonly used as coolants and lubricants in heat exchangers, pumps, electrical transformers and capacitors. Older electrical equipment and fluorescent lighting fixtures still in service may contain PCBs. The manufacture of PCBs in the United States and Canada has been banned. A warning sign near Marsh Creek in Saint John, New Brunswick. The creek has been contaminated with polycyclic aromatic hydrocarbons, chemicals found predominantly in petroleum-based products like creosote.